When looking at US business magazine Forbes’ annual list of the Philippines’ richest people, many of the tycoons credit their wealth to businesses they have built and grown over a long period of time, usually decades. Some of these have been passed down over many generations, while many others were established a few years after the end of World War II. But in the latest Philippine rich list published last August, there are a number of tycoons who trace a significant part of their wealth to companies put up only within the past 20 years. While seemingly going against the grain, the phenomenon also highlights the country’s better economic environment in recent years that has allowed businesses to flourish faster. The listed construction firm has built up a portfolio of real estate developments as well as large infrastructure ventures. Megawide is behind several major public-private partnership projects such as the Mactan-Cebu International Airport and the Southwest Integrated Transport System. Last July, it bought into the consortium handling the proposed PNR East West Rail Project. Related story: Will Megawide’s Proposed Train Project Bring Relief to Commuters Along Flood-Prone España? Megawide has also broadened its business into renewable energy, currently operating two solar power projects with a total capacity of 43 megawatts. The company ended 2016 with revenues amounting to Php17.7 billion, a 14.3-percent increase from the year before. After opening the first Puregold store in 1998, the listed retail company has expanded into a network of 329 supermarkets, shopping centers and restaurants by end-2016. That year, the company reported revenues of Php112.8 billion, growing 15.9 percent from 2015. In addition to its main Puregold stores, the firm has acquired several supermarkets, the most notable of which is the chain of S&R membership shopping stores. The company has also set up a joint venture for the local franchise of convenience store Lawson, which aims to have 500 branches by 2020. By end-2016, Mang Inasal had 465 branches nationwide. And while Sia is no longer its owner, Forbes still credits his wealth in large part to the fast-food venture, which propelled the 40-year-old to be a part of the business magazine’s annual Philippine rich list since 2011. After Sia’s stint with fast food, he then focused on growing a real estate company and eventually partnered up with Jollibee founder Tony Tan Caktiong for the venture. The result is one of Asia’s best performing property stocks, as its stock price rose by 2,500 percent from April 2014—when it listed in the stock market—to January 2017. 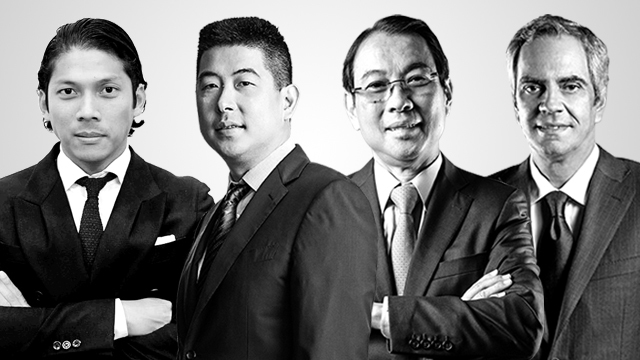 With revenues of Php3.7 billion in 2016, DoubleDragon is on track to becoming one of the country’s leading property developers. The company plans to broaden its network of community malls, CityMall, to 100 by 2020, targeting small communities around the country. Aside from being one of the country’s richest tycoons, Romero also has the distinction of being the country’s richest congressman. He is the party list representative of the 1-Pacman Party, and he declared a net worth of Php7 billion in his latest statement of assets, liabilities and net worth. While Forbes attributes Razon’s $4.3 billion net worth mainly to his ports business—which traces its roots as far back as the 1920s—the country’s third richest tycoon also receives a big chunk of his wealth from his newer gaming firm, which operates the Solaire Resort and Casino in Entertainment City in Parañaque. The listed company behind Solaire posted revenues of Php30.4 billion last year, an increase of 21.4 percent from the year prior. It is planning to open a second casino in Vertis North, a mixed-use township in Quezon City. Bedfordbury Development is a joint venture owned by Recto and UK-based Ashmore established in 2014. After Ashmore and property developer Alphaland ended their partnership, all of Ashmore’s assets with Alphaland were transferred to Bedfordbury, which included the Alphaland Tower in Makati. Not much else is known about the company, but it did make headlines for its disputes with the Wenceslao Group. It concerned 10 hectares of land in the Aseana City development in the Bay Area, which was one of the assets transferred from Alphaland to Bedfordbury. The newest company in this list also belongs to the youngest tycoon in Forbes’ latest rich list. The real estate startup sells made-to-order luxury homes designed by famous architects all over the world. Forbes listed Jose Roberto “Robbie” Antonio with his father this year as his startup is valued at $256 million after completing a $15.4-million funding round last March. That puts Revolution Precrafted in the running towards becoming the Philippines’ first unicorn—or a startup with a valuation of at least $1 billion. Which University Produced the Biggest Number of Philippine Senators? What’s the Impact of the Planned Hike in SSS Contributions on Employees’ Take Home Pay?